Against that backdrop, most Americans would be stunned to learn that the German Deutsche Bank, which perpetually finds itself on the wrong side of the law, was bailed out in five separate U.S. emergency lending operations during the 2007-2010 financial crisis, receiving more than twice the emergency financial assistance as that received by Lehman Brothers, the failed U.S. investment bank. According to the Government Accountability Office (GAO), Deutsche Bank received cumulative loans totaling $77 billion under the Federal Reserve’s Primary Dealer Credit Facility (PDCF) and $277 billion in cumulative loans under the Term Securities Lending Facility (TSLF) for a total of $354 billion. Lehman Brothers received only $183 billion in Fed emergency lending programs according to the GAO report. (See GAO chart below.) These loans were made at below-market interest rates, thus constituting a bailout. But Deutsche Bank received additional forms of bailouts during the crisis. According to Fed data turned over to Bloomberg News after a multi-year court battle, two units of Deutsche Bank borrowed at least $2 billion in low-cost loans from the Fed’s Discount Window during the crisis. And, it was finally revealed that Deutsche Bank was one of the banking behemoths that got a back-door bailout via the failed insurance giant, AIG. Deutsche Bank received $11.8 billion from the taxpayer for derivative transactions and securities lending obligations AIG was on the hook for. The U.S. government paid these obligations at 100 cents on the dollar, despite AIG being insolvent at the time and requiring a $185 billion taxpayer bailout itself for making casino-like bets with the big banks. 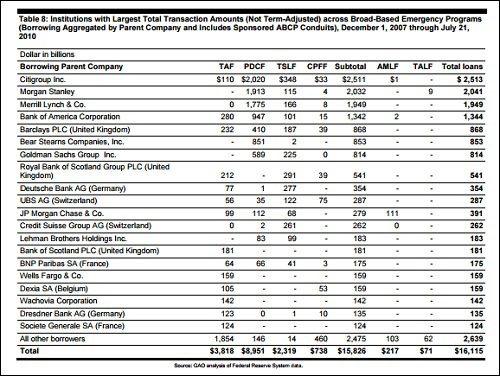 Public pressure eventually forced AIG to release a chart of these taxpayer payments. One of the most egregious aspects of the bailout of Deutsche Bank is that it has serially defrauded both U.S. taxpayers and investors. Its history suggests it would have been far more appropriate to yank its charter in the U.S. than to bail it out using U.S. taxpayers’ dollars. In 2015 Deutsche Bank settled charges with British and U.S. authorities for $2.5 billion for rigging the interest rate benchmark known as Libor. Deutsche Bank pleaded guilty to the U.S. charges. According to the U.S. Justice Department, Deutsche Bank also has a history of “participating in transactions used to defraud the IRS.” In 2014 Deutsche Bank, along with Barclays, was probed by the U.S. Senate’s Permanent Subcommittee on Investigations. The two banks had created elaborate schemes to assist hedge funds in converting millions of short-term trades into long-term capital gains to produce a much lower tax rate thereby cheating the U.S. Treasury of tax revenue. Called “basket options” or MAPS at Deutsche Bank, the bank effectively loaned out its balance sheet to hedge funds to conduct billions of trades each year in trading accounts under the bank’s name. Leverage as high as 20:1 (which would be illegal in a regular Prime Brokerage account for a hedge fund client) was often deployed. The banks got paid through margin interest, fees for stock loans for short sales, and trade executions. “About ten years ago, Deutsche Bank became the subject of a series of investigations focused on its participation in abusive tax shelters from 1996 through 2002, which aided and abetted evasion of an estimated $5.9 billion in U.S. income taxes. On December 21, 2010, Deutsche Bank and the U.S. Attorney for the Southern District of New York executed a non-prosecution agreement (NPA) related to the bank’s involvement with the abusive tax shelters. 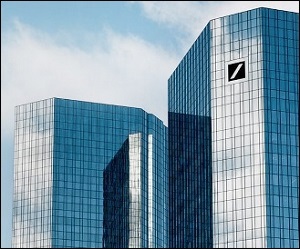 Under the agreement, the bank paid more than $550 million to the United States, and the U.S. Attorney and the U.S. Department of Justice (DOJ) agreed not to prosecute Deutsche Bank criminally for participating in abusive tax shelters benefiting its clients from 1997 to 2005, provided the bank met certain requirements. Now, according to a recent report in the Wall Street Journal, the U.S. Department of Justice believes that Deutsche Bank owes American taxpayers $14 billion for selling toxic mortgage backed securities that helped to collapse the U.S. housing market during the financial crisis. The swoon in Deutsche Bank’s share price has gained momentum since the publication of the $14 billion figure. (That’s not the taxpayers’ problem; that’s the problem of a bank that serially engages in fraud.) Last Friday, the news agency Agence France Presse reported that the Justice Department may be planning to settle the case on the cheap for $5.4 billion. Let’s be clear on whose shoulders those missing billions in fines against Deutsche Bank are going to fall. It’s America’s young people who will face a higher national debt and a lower standard of living because the U.S. government is now addicted to bailing out and propping up serially out-of-control global banks whose business models increasingly resemble that of a crime syndicate. Settling a $14 billion crime for $5.4 billion is, effectively, another U.S. bailout of a bank that has frequently gamed U.S. markets and fleeced taxpayers. In less than a decade, the U.S. national debt has skyrocketed from $9 trillion to more than $19 trillion today — much of that debt explosion coming from the effects of the banking crisis and the worst economic slump since the Great Depression. In the wake of its tanking stock price, Deutsche Bank has launched a major public relations offensive. In a front-page article in the Frankfurter Allgemeine Sonntagszeitung, major heads of German businesses like BASF, Daimler and Siemens spoke in support of the bank, pushing the theme that Germany needs its own big global bank to finance their global ambitions. The article comes at a time when Angela Merkel, the Chancellor of Germany, is under a deluge of political pressure to forego any thought of bailing out this serially troubled bank. That gives a whole new meaning to speculation, even by the wild west standards of U.S. banking. Is Deutsche Bank as Dangerous to Financial Stability as Citigroup Was in 2008?